A tanker drops fire retardant chemicals on a brush fire that has covered more than 700 acres. Evacuations have been ordered for 200 homes, including some in the La Cresta and Bear Creek communities in west Murrieta, after the Wildomar Fire grew to 700 acres overnight, fire officials said Friday morning. No structures have been damaged, according to the Riverside County Fire Department. The fire is 15 percent contained. 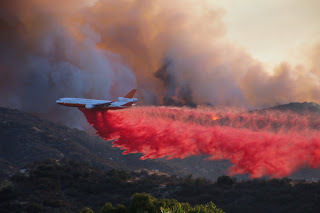 According to a California Highway Patrol report, the fire started about 12:30 p.m. Thursday when a man riding his dirt bike in an Off Highway Vehicle area in the Cleveland National Forest crashed into a tree and gasoline leaking from the bike's tank ignited. The man, who received minor injuries, was unsuccessful in putting out the fire before it quickly spread. By 5 p.m., the fire had moved northeast, spreading over 200 acres and forcing evacuations of five residences along Hixon Truck Trail. By 8 p.m., 350 acres had burned.